My close association with Tun Hamid began when he was appointed the Chairman of the Advisory Board of the Malaysian Ant-Corruption Commission (MACC) and me a member in 2010. My respect for him grew over the months. I was already acquainted with some of his writings and speeches, and his firm and wise stewardship of the Advisory Board impressed me. His reputation for integrity and acting without fear or favour gave the MACC a much needed boost in the early period when the re-constituted institution was striving to regain the trust and confidence of the people. The MACC missed him greatly when ill-health compelled him to give up the chairmanship of the Advisory Board. But I continued to be in touch with him. He would share some of his articles and speeches with me and I visited him in hospital too. Though in pain he would welcome visitors cheerfully and engage with them as best he could. I learned a lot from Tun Hamid. I still do. He is among the most learned minds Malaysia has produced in the legal field. Certainly his work is the most prolific. His thirst for knowledge, analytical skill and clarity of thought combine with his gift for expression in both the English and Malay languages to make him exceptional. Then there is his great capacity for work. He has a terse motto, BUAT KERJA. It aptly sums up his utter dedication for work. The sheer volume of his judgments, speeches and articles is mentioned elsewhere, including in his website. His most productive period is the period after his retirement and for the most part while he was in poor health. Tun continues to write. This book traces the journey of Tun Hamid from the dirt-poor kampung in the Malay heartland where he was born to the peak of the Malaysian legal and judicial service and his retirement. The story is told in a style that to me is the most difficult: in simple words and short sentences. The style also graces his writings, be they legal opinions, court judgments or the articles he has written and the speeches he has delivered. It is a style that often reduces what appear to be complex issues to their simplest elements. I found the book difficult to put down. Tun Hamid is a natural story teller. One is transported to the past, to the way things were and how far Malaysia has come. His recall of detail, right down to the number of students that were in his class and their racial breakdown when he was in Form Six, is amazing. He must have kept faithful and extensive records from an early age, besides having a very good memory. The book is also peppered with the occasional wit. One of my favourites is his tale of how he won a case before the Supreme Court “without saying a word” (Chapter 5). For me the greatest value of the book lies in what can be learned from the life that Tun Hamid has lived and what he stands for. The son of an Imam who grew up in a harsh and bare village environment, he developed a strong moral and upright character. An abiding faith in Allah shines through his life. He kept his faith even when grave illness confined him to bed and robbed him of his voice for months with little hope of regaining his health. Honesty, integrity and the courage to speak his mind to power became his hallmarks. His judgment in the case of Dato’ Seri Anwar Ibrahim has made history. It is one of the high points of the independence and integrity of the Malaysian judicial service. I believe he inherited a deep sense of justice and regard for the rule of law early on from his father, who though without formal training was often called upon to mediate and settle village disputes. The title of this book, I Will Never Beg, could be a guide for ethical conduct and a compass in life for all. Tun Hamid wrote, spoke and issued judgments on many critical areas of law during his career. 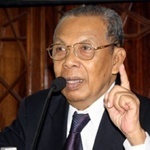 His contributions towards laws on Islamic banking, Islamic finance and Takaful are significant. Some of the subjects he covered, such as the harmonisation of civil and Shari’ah law, hudud and conversion into Islam, remain vexing. His arguments however are clear and based on applicable law that is consistent with the Constitution. They are in the public domain and open to scrutiny and comment. His view of what Islam is and what it enjoins is refreshing. It is drawn from the sound grounding he received when young and his immersion in the teachings of Islam since. In the present circumstances when the religion as taught and practiced in the country seems to be getting increasingly rigid, intolerant and extreme, Tun Hamid’s views appear humane and enlightened. Islam preaches moderation. Prayer is a quiet matter, one between self and God even when in congregation. He is distressed by what he sees as the emphasis on form over substance. He regrets the unnecessarily loud ceramah and taped recitation of the Qur’an blared from loudspeakers that disturb the peace and the faithful in the mosque who want to do their prayers or recite the Qur’an quietly. He is dismayed by the trend to place greater emphasis on the feasting at functions in hotels rather than on the fasting in the holy month of Ramadhan. Tarawikh means relaxing, and it is meant to be a relaxing affair, not the prolonged event with ceramah that it has frequently been turned into. His description of Islamic law as “Any law that is not un-Islamic” has gone viral. To quote from one of his lectures, “To determine whether our law is Islamic or Shariah-compliant or not, we should not be looking backward one thousand four hundred years and compare whether our present law is the same as the law then or not. The test should be whether it contravenes any Shari’ah principle or not”. The story of Tun Hamid is also the story of the triumph of human endeavour over the many challenges and handicaps that life can hold. But triumph always with the grace of God, as this deeply religious man would say. A book that is as nourishing to the mind as it is to the spirit. Tun Hamid’s intellectual genius lies in identifying the core issue of a problem, and framing it with elegant simplicity and lucid wit. Combined with his principled thinking and behavior, his genuine humility, unassuming piety and major contributions to Malaysia, is why I admire, esteem and emulate him as a moral exemplar—and why every Malaysian should. – Imam Feisal Abdul Rauf, Cordoba Initiative. I have kept up with reading Tun Hamid’s writings for many years. I have found them to be remarkably lucid, direct and insightful. This is yet another elegant contribution, though of a different kind, coming from one of the outstanding legal minds of Malaysia.- Professor Mohammad Hashim Kamali, International Institute of Advanced Islamic Studies (IAIS) Malaysia. Tun Abdul Hamid’s ability to explain the most complex legal problems in a simple, understandable, and very interesting way is what sets him apart from other legal scholars. – Dr. Adnan Trakic, Monash University Malaysia.